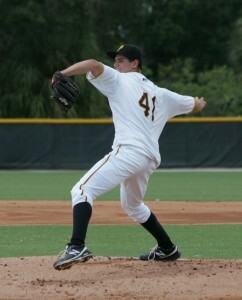 Billy Roth threw four shutout innings today. The Pittsburgh Pirates took right-handed pitcher Billy Roth in the 16th round of the 2013 draft, giving him a $190,000 bonus, which amounted to $90,000 against the draft pool. Roth was a highly rated prep pitching prospect with a clean delivery, a fastball that could touch 92 MPH, and a sharp breaking ball. Coming into today’s start he had a 1.50 ERA in 12 innings on the season. Today was the first time I had a chance to see Roth pitch, and he once again put up strong results, throwing four shutout innings with two walks, two hits, and one strikeout. Roth retired the side in order in the first inning, sitting 90-91 MPH and touching 92 twice. He sat in the 90-91 MPH range the entire outing, dipping down to 89-91 in the fourth inning, but never reaching 92 after the first. To put this in perspective, Tyler Glasnow and Nick Kingham were also both 89-91 MPH out of high school, and didn’t see their velocities increase until their second and third years in pro ball. Most high schoolers are in the mid-to-upper 80s, so sitting 90-91 for a few innings at this age is a good thing. Roth started the second inning with a strikeout looking on a nice changeup. The pitch had a lot of break, and looked almost like a slider. The changeup sat 83-84 MPH, giving him some good separation from the fastball. He also threw a few curveballs in the 77-81 MPH range, but he was mostly sitting fastball/changeup. The curveball also showed some good break. His curveball was advertised as his best off-speed pitch out of the draft, and his changeup was advertised as needing work. I was surprised not only at how good the changeup looked, but at how comfortable he was throwing it. The outing looked great on paper, with Roth throwing four shutout innings and giving up two walks and two hits. He was saved by his defense on a few occasions, and dealt with some control issues in the third and fourth innings. In the second inning he gave up a double on a hard hit ball to straightaway center field. Austin Meadows initially turned the wrong way, and because of that he had no shot on the play. It was difficult, but he might have made the catch if he would have gone to his left initially. He made up for that by making a strong throw from deep center to get the runner trying to stretch a double to a triple. Roth hit a batter in the third inning, but the runner was erased on a caught stealing by Reese McGuire. I managed to get that caught stealing on video, which you can see below. The video is distorted due to some issue with my Instagram app, but you can still see the good footwork by McGuire, the quick release, and the strong and accurate throw down to second. This is what I’ve seen out of McGuire every time he’s made a throw. Billy Roth pitching and Reese McGuire throwing out a runner. Sorry for the distorted view. Instagram changed things up on me. Roth gave up a leadoff single in the fourth inning, followed by a fly out to center field. He then got out of the inning thanks to an amazing play by shortstop Trae Arbet. Roth got a hard grounder to the right of the mound, which had Arbet setting up for the easy 6-4-3 double play. Roth went for the ball and it deflected off his foot and up in the air, in the opposite direction that Arbet was moving. The shortstop made a quick change in direction, fielded the ball cleanly, and made a quick release to barely get the runner at second. A quick turn and a strong throw from Ulises Montilla got the runner at first to end the inning and end Roth’s day. It was an impressive play by Arbet on an unfortunate hop that probably should have gone for a hit. Roth didn’t look bad at all. The defense helped him out, and he had some control issues. He didn’t look as dominant as his stat line, but he showed some promise with his pitches, and wasn’t afraid to throw the changeup often, with some good movement on the pitch. That changeup development is usually the key for a prep pitcher to go to Jamestown in his first full season, so that will be a thing to watch with Roth’s development. Overall Roth was as advertised, and it looks like that changeup development and his fastball command will be the biggest priorities, as they are with every pitching prospect in the lower levels of the Pirates’ system. 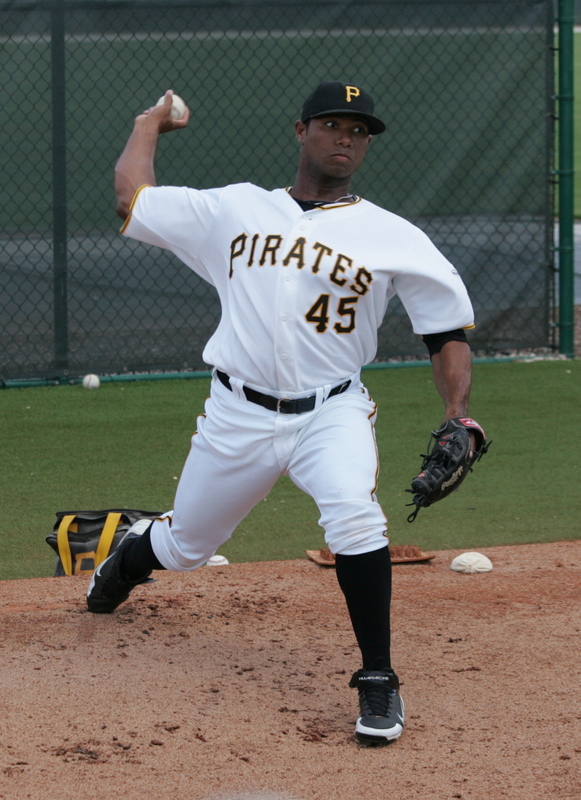 Yhonathan Barrios was sitting 93-95 MPH today out of the bullpen. Today was the first time I had a chance to see Yhonathan Barrios pitch. Barrios was signed in 2008 as a shortstop, getting a $250,000 bonus. That was one of the biggest international bonuses of all time for the Pirates when it was signed. He was advertised as an offensive minded shortstop with some pop in his bat, but stalled out in the NYPL with a .187/.244/.223 line in 166 at-bats over the last two years. The Pirates recently switched him to a reliever, trying to give him a better shot at extending his career. Barrios was impressive in one inning of work today. His first fastball came in at 91 MPH, which would have been impressive for a guy who just picked up pitching. Everything after that was 93-95 MPH, with Barrios hitting 95 twice. His fastball had some good downward movement and he was throwing it for strikes. He also threw two sliders and two changeups. The sliders were both 79 MPH and had some front door breaking action, starting off outside the plate on the right side and breaking in at the last second. I was more impressed with his ability to get movement on the pitch. The slider right now isn’t a great pitch, but could have a chance to improve. The changeup was the most impressive pitch. He was 81-82 MPH with the pitch, showing good late break away from the one left-hander he faced. He started off with two changeups in that at-bat, then followed up with a 95 and a 94 MPH fastball to get his second ground out of the inning. Barrios only needed about ten pitches to get through the inning. I wouldn’t go crazy projecting him right now. Minor league relievers usually end up as organizational depth, even if they can hit 93-95 with good off-speed stuff. That’s especially true in the GCL. Barrios has now given up one run on four hits in nine innings as a pitcher, with a 7:4 K/BB ratio, so he’s off to a good start. I don’t know if this will get him to the majors, but I know that he wasn’t making it out of short-season ball as a hitter, and he’s got a shot to at least reach high-A with the stuff he has now. That’s all based on one month as a pitcher, so there could be room for improvement going forward. The Pirates had three outfield assists today, one from each outfielder. Meadows had an assist in the second inning. He also went 1-for-3 with his 11th double of the season. Henrry Rosario showed off a cannon in right field, throwing out a runner at third. Rosario’s throw was a bit high, but it had plenty of time to get the runner who was trying to go from first to third on a single. Enyel Vallejo had the other outfield assist, throwing out a runner at home to preserve the shutout. Vallejo went 1-for-4 at the plate. I would figure Ramirez to be faster than Meadows. Does that play into it or is it based on experience at this point? I guess it doesn’t matter. Neither guy would be playing CF in 3 years or so unless Cutch is gone and Marte and Polanco both fail. What I’m most interested in for next season is catcher at West Virginia. McGuire, Mattheison and Jhang are all lined up to head there logically. I guess two could play C and DH and one will be McGuire. But who is the odd man out and does he change positions, or get pushed ahead to Bradenton? Ramirez hasn’t been playing CF much this season so I’d assume Meadows. Are Ramirez and Meadows both going to be in WV next year? If so who gets to play CF? I think that would be the outfielders who are in between Meadows and the current group. Guys like Josh Bell and Harold Ramirez. Ok. I’m about 2 or 3 years ahead of myself but staying in CF would help his trade value. The earliest Meadows would arrive would be mid-2016 or 2017. He would be 21-22 in those years. Andrew McCutchen and Starling Marte are both currently under control through the 2018 season. Meadows might be the guy who takes over if McCutchen leaves. How’s Meadow’s arm? I’ve heard varying reports and figured most if not all of his value would come from the offensive side. I’ve seen him make two strong throws from the center field wall this year, with today’s being the second one. He’s got some defensive tools that could keep him in center.